I have a real soft spot for animated movies, which is why I started searching for movies like The Angry Birds movie right away! When I need a feel good movies, these films are right there to both make me laugh and sometimes even cry a little! Don’t tell me you haven’t got a little teary during animated movies, and those writers srsly know how to pull at your heart! I can’t be the only one yelling in my head “…but he can’t fly, and it’s so sadddd! Oh wait, that last joke was hilarious!” It’s seriously a roller coaster, I just can’t even. Below is a little more about (brand new!!!) The Angry Birds movie and three more movies like The Angry Birds movie you have got to check out. 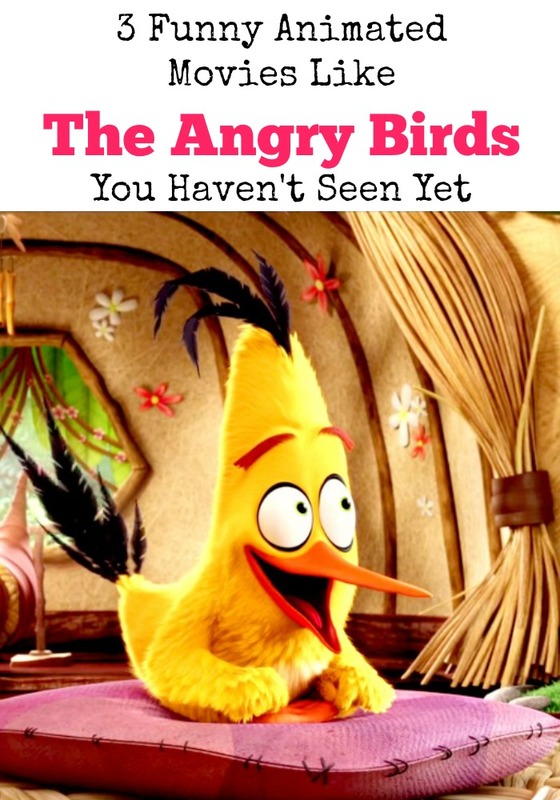 The Angry Birds Movie is a computer animated movie that isn’t due to hit theaters until May 20, 2016. The movie combines adventure, action and comedy with all those funny birds and piggies we know and love. If you are shamelessly excited about The Angry Birds Movie, here are some other movies that are like that movie to check out! Storks is a new movie coming out this fall, but it looked so funny I thought I’d give you a second to look forward too! Storks is a 2016 3D computer-animated comedy movie that is set to hit theaters on September 23, 2016. It will star the voice cast of Andy Samberg as the role of Junior, the top delivery stork at the Stork Factory and Kelsey Grammer as the role of Hunter, the CEO of the Stork Factory. The movie will also feature the voices of Katie Crown, Keegan-Michael Key, and Danny Trejo although their exact roles are not known at this time. The Stork Factory used to deliver babies, but now delivers packages for an online company. One day, Junior accidentally switches on the Baby Making Machine, and he must remedy the situation before the boss finds out his mistake. Free Birds is a 2013 3D computer animated comedy buddy movie that was released in theaters on November 1, 2013. The movie stars the voice cast of Owen Wilson as Reggie, a domesticated turkey; Woody Harrelson as Jake, a wild turkey, and Amy Poehler as Jenny, Reggie’s love interest. Reggie and Jake are two turkeys, who are from different sides of the track, but team together to go back in time to ensure turkeys are not part of the Thanksgiving tradition. Rio is a 2011 3D computer animated musical comedy adventure movie that was released in theaters on April 11, 2011. The movie features the voice cast of: Jesse Eisenberg as Blu, a male macaw; Anne Hathaway as Jewel, a female macaw; Jamie Foxx as Nico, a canary; George Lopez as Rafael, a toucan; Tracy Morgan as Luiz, a bulldog; Jemaine Clement as Nigel, a cockatoo; Leslie Mann as Linda, a young girl; Rodrigo Santoro as Tulio Monteiro, an ornithologist; Carlos Ponce as Marcel, Nigel’s owner and Jake T. Austin as Fernando, Marcel’s assistant. Blu is from a small town, and Jewel is fierce and independent. When the two of them team up together on an adventure, you never know what will happen. So lovelies, is The Angry Birds movie giving you life? What other movies like The Angry Birds movie have you watched? Leave me some love in the comments!